My children love to be read to and what can be better than going on an adventure with talking dogs? 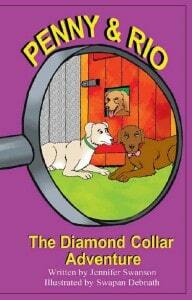 We were excited to review the new Penny & Rio book “The Diamond Collar Adventure” by Jennifer Swanson. This is the delightful third book in the dog detective series and it does not disappoint. These early chapter books are perfect for young readers and the bright, cheerful pictures make it an excellent read aloud book for even the youngest book lovers too. In “The Diamond Collar Adventure” Penny & Rio go on the adventure of a life time in search of a diamond collar lost by the beautiful show dog, Hannah. Their capers make for a fun mystery that captivated my children chapter after chapter. Do you ever feel a sense of dread when your child brings you a book to read aloud for the umpteenth time? You will not have to worry about that with the Penny & Rio books because it was just as entertaining for me as it was for my kids. This book is a new favorite in our house and I can’t wait to read the first two books in the series. My children even play acted the book one evening dressing up as their favorite characters and searching for our dog Jack’s collar that “mysteriously disappeared.” I love that a book could inspire their imaginations. To purchase your copy of Penny & Rio “The Diamond Collar Adventure” or to learn more about the series go to Penny and Rio. Also, to celebrate the release of “The Diamond Collar Adventure” check out the Penny & Rio contest. Create a jeweled collar for your dog and you could win a $50 gift card to Barnes and Noble.com. I learned that the author is committed to helping animals and adopts dogs.